Giving birth to my premature twin boys evoked a lot of emotions for me as a new mom. During those first few weeks in the NICU, the joy I expected to feel was overshadowed by hardships and heartaches as I watched my babies struggle to develop and constantly worried about the potential short and long term effects prematurity would have on them. It has been a long, emotional and physically exhausting road since my twins, Noah and Nikoh, were born at 29 weeks. 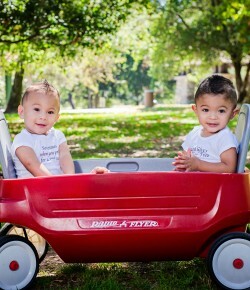 But almost two and a half years later, I now try to focus on the positives and why it rocks to be a preemie twin mama. Today I Beam With Pride – Preemie parents will refer to their baby’s “adjusted” or “corrected age” for at least the first year of life. Adjusted age is calculated by subtracting the number of weeks a baby was born premature from his/her chronological age. At first it’s frustrating when someone asks you, “how old are your babies?” I remember all to well saying, “They are 6 months old, but they were born 2 months early so that’s why they are so small.” That explanation never felt good, especially when you are evaluating your preemie’s growth and progress and always stressing about whether they are going to reach anticipated milestones on time. But once my preemies caught up, boy oh boy I was a proud mama! And the icing on the cake was the first time someone told me, “Wow, I’d never guess they were born premature.” At that point as a preemie parent you will be overwhelmed with pride at how much strength and perseverance your tiny but mighty preemies have shown. Today no one would ever guess my twin boys were preemies and that makes me smile from ear to ear because they have come so far in such a short amount of time. Noah (Left) and Nikoh (Right) in July 2016 quickly approaching 2 1/2 years old! I‘m Grateful Everyday – I always felt like I was a thankful person who showed appreciation and kindness. But after I had my preemie twins, gratitude took on a whole new meaning. I have so much gratitude for all of the doctors and nurses who worked around the clock to make sure my babies survived, and so much respect and admiration for every single premature baby and their parents. The NICU is a rough place to be, but preemies and their parents somehow make it through the darkest of days. I am grateful I got to be a stay-at-home mom who had the rare opportunity to see my twins reach every single milestone, and be there to comfort their every pain. I have tremendous gratitude for the little things, the everyday things like bathing, feeding, teaching, smiling, laughing, crying, not sleeping, ALL of it. I am thankful for every single moment because I know some preemies aren’t as lucky as mine. Some won’t thrive, and sadly some won’t survive. So I never take my preemies for granted. I have and will continue to sacrifice everything to make sure in my life, my twin boys come first above anything and anyone else.